The MasterGuard Hub System also includes a lifetime warranty. The MasterGuard Hub System is the most durable and simplest hub system available. 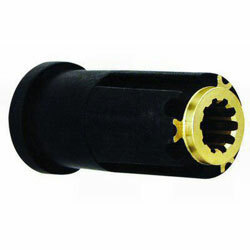 Utilizing a triple tapered key and keyway system, the MasterGuard Hub leaves no room for error. This premium hub system adapts to Turning Point's Rascal®, Hustler®, Express®, SpeedZone® and Classic® propeller lines. Eliminate Hub Cracking & Failure: The glass reinforced high-tech polymer construction increases flexibility, eliminating potential material stress fractures.